Well, look at you being all soupy slurpy delicious wontons. I love vegan wonton soup. It’s so simple, like really, really simple. The soup part is literally just broth with some green onions tossed in to look all fancy (and because green onions are the bestest). Then just add in some homemade vegan wontons, and presto! A soup that wows. I’m not even talking about wowing guests because serving this soup to four guests? Ha! Yeah right. I slurped up this goodness all to myself thankyouverymuch. I’m sometimes not the best at sharing my deliciousness… but that’s ok because who else is willing to eat semi-cold, overly photographed “dinner” with me at 4 in the afternoon? The life of a food blogger, I’m telling ya. It’s rough. (It’s not). Ok wait, I’m making this vegan wonton soup sound less delicious than it is. The point I’m trying to make is, that even though the soup was semi-cold, I still didn’t want to share a single drop or wonton because just so much yum going on. My first attempt at wonton filling involved mushrooms and carrots. The mushroom part was delightful, but the carrots were all sorts of not right. Too much carrot flavour, not enough texture play. Nope. Scratch that, try again. Second attempt, I seasoned the mushrooms in a slightly sweet, soy sauce, ginger, garlic, and rice vinegar marinade, and (get this) added in finely chopped walnuts. The result: amazing. The soft marinated mushrooms paired with the slight crunch of the walnuts, oh baby. All 20 wontons are mine. All mine. 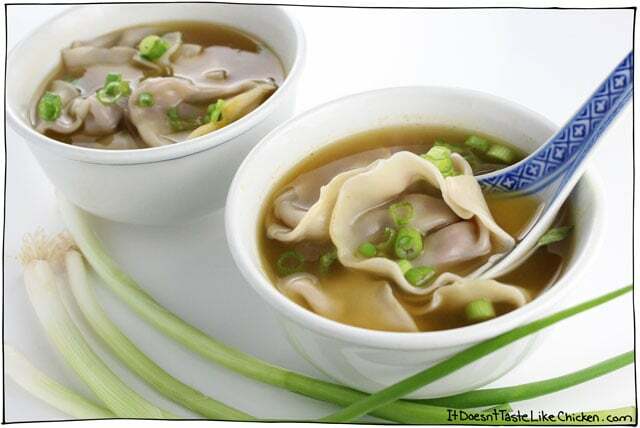 To make vegan wonton soup, first start by making the wonton filling. Add all the of the seasonings along with the chopped mushrooms and walnuts to a bowl and toss well to combine. I preferred the walnuts when they were chopped finely so they weren’t as crunchy, but if you like more crunch, leave them larger, it’s up to you! Now you can set up your wonton making station by taking your wonton or dumpling wrappers, a small bowl of water, and your filling. 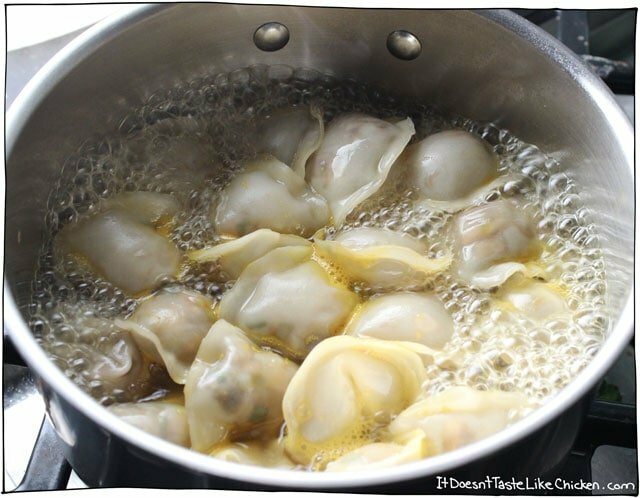 Make the wontons by taking one wonton wrapper, putting about 1 teaspoon of filling in the middle. Dip your finger or a brush in some water and run around the edges of the wonton. Fold over and firmly pinch the edges together to seal in the filling. 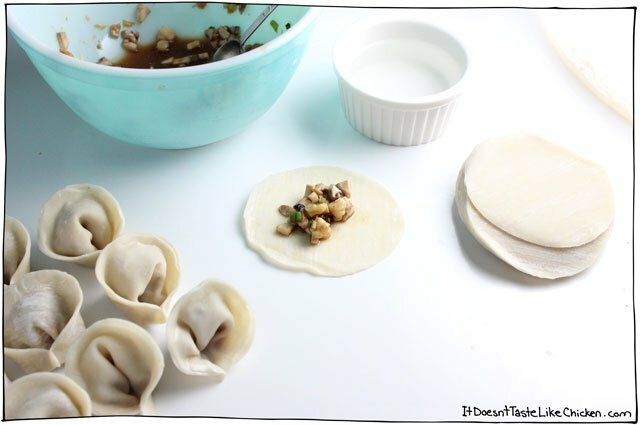 Optionally, you can then wet the two points and fold the wonton in half and pinch the points together. This just makes for a pretty shape, but I found that about half of the wontons undid when boiled anyways so it’s totally optional. Alternatively, you can just leave them in this half moon shape which is also cute. Bring your vegetable broth to a boil and drop the wontons in one at a time. Boil for 5 minutes. 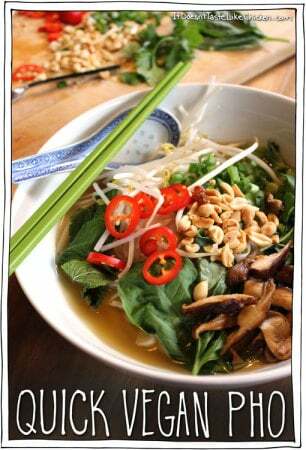 Serve the soup by dividing the broth and dumplings between 4 bowls, and garnishing with the green onions. Easy and so yummy. The wontons are stuffed with slightly sweet, soy sauce, ginger, garlic, and rice vinegar marinated mushrooms and chopped walnuts. The texture combo is amazing. 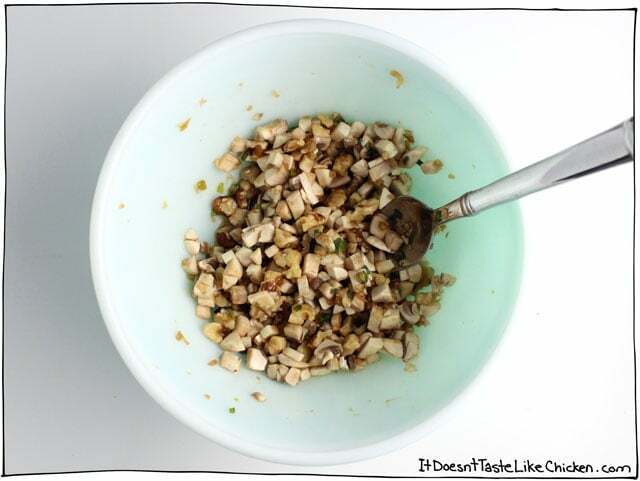 Add all the of the seasonings along with the chopped mushrooms and walnuts to a bowl and toss well to combine. I preferred the walnuts when they were chopped finely so they weren’t as crunchy, but if you like more crunch, leave them larger, it's up to you! Now you can set up your wonton making station by taking your wonton or dumpling wrappers, a small bowl of water, and your filling. 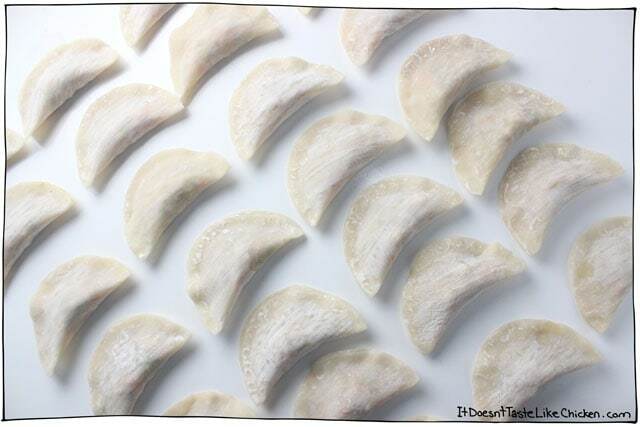 Make the wontons by taking one wonton wrapper, putting about 1 teaspoon of filling in the middle. Dip your finger or a brush in some water and run around the edges of the wonton. Fold over and firmly pinch the edges together to seal in the filling. 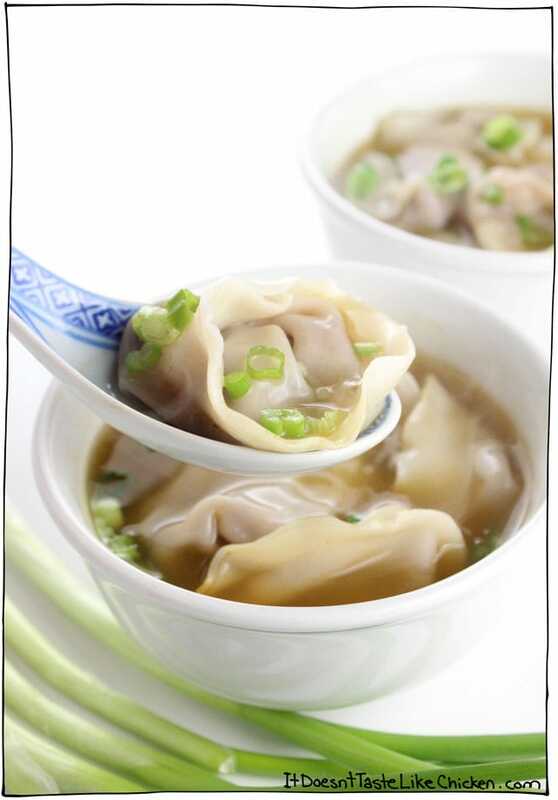 Optionally, you can then wet the two points and fold the wonton in half and pinch the points together. This just makes for a pretty shape, but I found that about half of the wontons undid when boiled anyways so it’s totally optional. Half moon wontons are pretty too. Bring your vegetable broth to a boil and drop the wontons in one at a time. Boil for 5 minutes. Serve the soup by dividing the broth and dumplings between 4 bowls, and garnishing with the green onions. I couldn't find egg-free wonton wrappers so I just used some dumpling wrappers I found that were vegan-friendly. 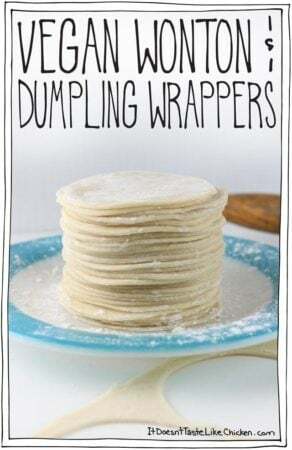 Alternatively, you could make your own with my recipe for vegan wonton & dumpling wrappers here. Amazing !!! I also used your recipe for the Wonton Wrappers. Those were much easier than I thought they would be. I added Spinach and Cooked White Beans (along with the green onions) to the broth at the very end. An incredible lunch on this unusually rainy Los Angeles day ! I made these today, and these are heavenly! I added to the mushroom mixture, some dried shiitake mushrooms that I rehydrated, sesame oil, combo of roasted cashews and walnuts, some cilantro and some panko crumbs, in addition to your ingredients listed, I doubled recipe and made about 53 wontons. I am flash freezing the rest as I write so I can have them on hand for quick meals. 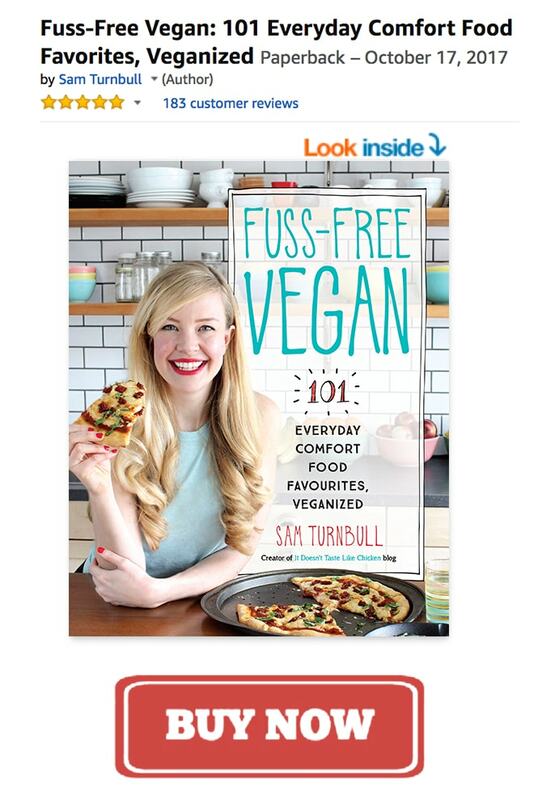 I just bought your “Fuss Free Vegan” cookbook and I am looking forward to cozying up by the fire and reading over this cold Canadian winter day and trying more of your delicious recipes! I used dry white wine instead of rice vinegar and honey instead of sugar in the wonton filling mix. . I boiled them in a hearty vegetable soup- my recipe- including raw blended tomatos, stirfried eggplant, onion and carrot cubes, garlic, mushrooms, canned chick peas and black pepper and salt. The wontons are delicious! I used Gefen brand round wonton wraps- no eggs in the ingredients. You may need to find it in a Jewish grocery store or any large supermarket that sells Kosher frozen products. OMG! This was soooo good! It’s now one of my all time favorite plant based meals! It was absolutely delicious! I added a splash of soy sauce to the broth, and chopped Bok Choy. Also added a splash of sesame oil to the mixture for the wontons. My husband said I outdid myself! 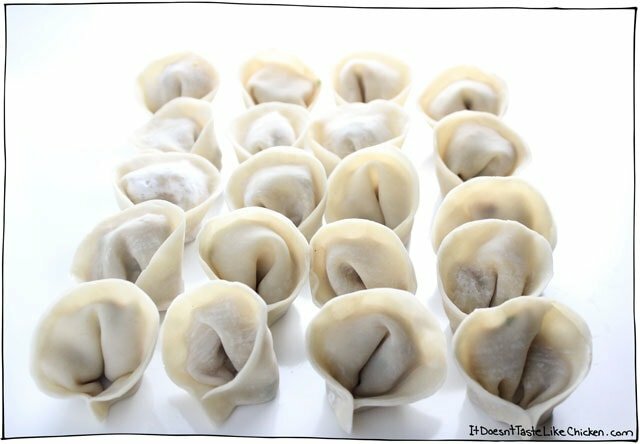 I realize I’m a bit late to the game commenting on this post, but with regards to the wontons popping open during the boiling process: I used to work at a restaurant where I had a reputation for rangoons that never fell apart in the fryer, and the secret is the egg wash I used to seal them. Since going vegan, I’ve tried to recreate it without eggs, and I’ve had phenomenal luck with 3 parts aquafaba, 3 parts non-dairy milk, and 1 part cornstarch or powdered egg replacer (that works out to TBS, TBS, tsp for a small, personal batch). Can’t wait to try the mushroom/walnut filling, sounds AMAZING! Great idea, Lindsay! I will have to try that! Today is one of the first cool days in Virginia so the soup was perfect for lunch. I substituted almonds and sunflower seeds for the walnuts b/c that’s what I had available. Turned out fantastic. After 2 of your recipes I’m hooked and will be ordering your cookbook. Can’t wait to get it. I am making another full load and freeze them. 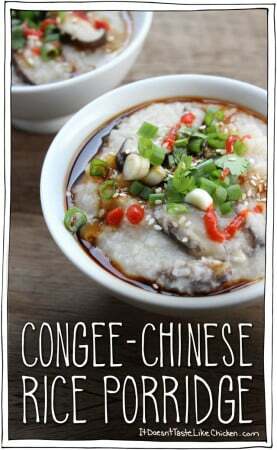 I added a tablespoon of soy sauce and a tablespoon of sesame oil to the broth and it took it up a level! Fantastic recipe! What would you substitute for the mushrooms? Trying to find what would be as meaty and hold the flavor as mushrooms do, but being highly allergic to mushrooms finding alternatives can be tricky. I don’t use vinegar, since it’s fermented. Do you have any other suggestions? Maybe a squeeze of lime juice?? Thanks! Yes, lemon juice would work just fine I think. It’s just for a bit of acidity. Enjoy! Sam, this looks amazeballs! 🙂 Do you think you could do up a big batch of the wontons and freeze them? Thanks, Sandy! Yes, I think that would be fine. I would freeze them on a parchment paper-lined baking sheet in a single layer, then once frozen solid, you could transfer to a freezer friendly bag. I bet you could pop them directly into the soup from frozen, they would just require a little longer boiling. Enjoy! This looks yummy and fun. 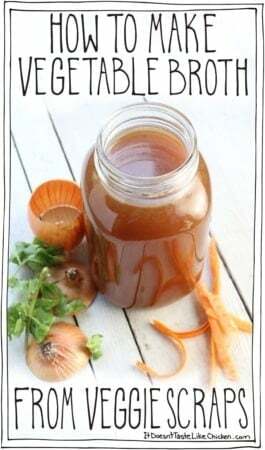 Do you happen to have a favorite vegetable broth? I have had such a hard time finding one I really like, and they are all so different from one another. I really like making my own, but otherwise my favourite is Presidents Choice organic vegetable broth, but that’s only available in Canada, not sure where you live. My husband is allergic to nuts. Anything else I could sub for the walnuts? Hmmm… pepitas (pumpkin seeds), might make for a nice texture if seeds are ok. 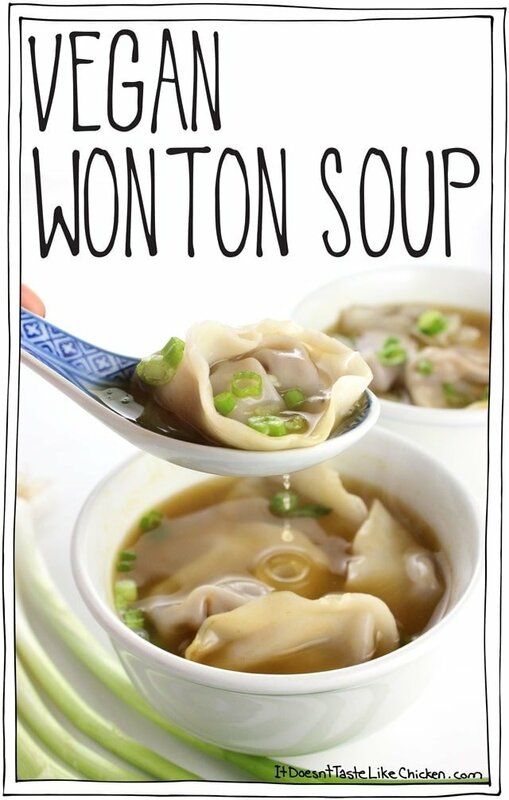 I love love love wonton soup <3 Honestly, I'm drooling all over that first photo! Im not much of a cook, but love wontons, so I thought Id give it a crack… to my surprise they are really good, bloody delicious actually. Great and simple recipe. Didn’t think of that! He loves raw cashews! Thanks so much! 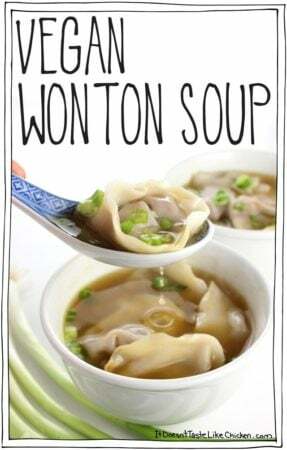 I seriously was just thinking about finding a recipe to make a vegan wonton soup this week! This looks delish! One question: My husband is allergic to walnuts and pecans. 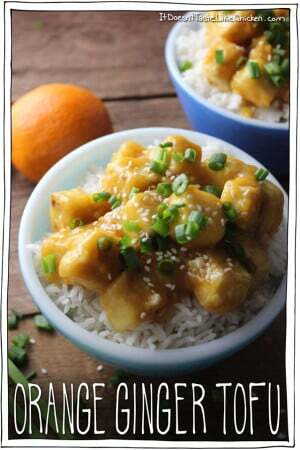 What do you think of substituting in water chestnuts? Or do you have another suggestion? Also, you are such a cute girl! Thank you for sharing! Is he allergic to all nuts? 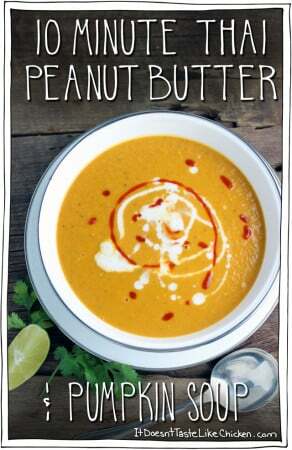 If not, you can use raw cashews.